String of shells settling substrate for Olympia Oysters. As I step into the aquaria room at Moss Landing Marine Laboratories (MLML), I always notice the abrupt sensory differences between that room and the outdoors. Numerous waterfalls pouring from valved pipe fitting and hoses replenish tanks of various sizes with the seawater that marine organisms need. The continual splashing of this water is overlaid with a mixture of sounds from pumps and bubbling air stones, designed to diffuse bubbled air so it is more easily dissolved into the water. The piped walls and troughed floors provide a strong seawater circuit that controls the temperature and smell of the air – cool and salty. This aquaria room is crucial to the work of the students at the lab. 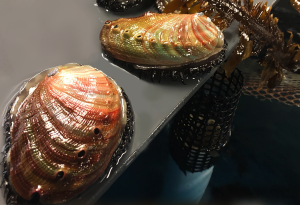 The room’s newest occupants may help recover a once abundant inhabitant of the North American West Coast’s bays and estuaries: the Olympia oyster (Ostrea lurida; or Olys for short). Although most of the organisms I’ve cultured in the aquaria room have been seaweeds, I recently had the opportunity to participate in the culturing of these native invertebrates. Our filled graduated buckets house these small oysters, and sit in a heated water bath in the back corner of the room. The Olys have been observed to release larvae at higher temperatures, and we’ve determined that conductive heat would be the easiest way to maintain these higher temperatures. Our broodstock, or adults that we are specifically using to produce larvae, are contained within three separate buckets: two containing Olys from Kirby Park and one containing Olys from Azevedo Pond. We have been hoping that some of these individuals are gravid, but there is no way to be sure without prying open the shell and killing the oyster. We instead have been sticking to daily observations using a high-powered spotlight. Every day, Peter Hain, the expert invertebrate aquaculturist, and I switch off transferring these broodstock to clean and preheated buckets. We then pipette in a highly concentrated mixture of diatoms and flagellates that quickly swirl around the bucket following the flow of our added air-stone. The end result is a brownish green diluted soup that is consumed entirely by the following day. Dr. Jillian Bible, from Bodega Marine Laboratory, has informed us that these oysters thrive under a specific density of phytoplankton per liter of seawater. Jill has had experience culturing Olys in the past, and her advice has been crucial for our setup design and maintenance scheduling. Before I switch out and feed the last oyster containing bucket in the bath, I click on my spotlight. This Azevedo bucket, which I’ve observed has a partially foamy sheen, seems to have less water clarity than the other buckets. By shining this spotlight through the side of the bucket, I will be able to illuminate whatever larvae are swimming around within the bucket. Much to my surprise, I spot thousands of slowly moving larvae within the beam. Using a mixture of sieves and buckets, I gently siphon the young oyster pedi-veligers (the specific free-swimming Oly larval type) to minimize the oyster waste and various other organisms that may have hitched a ride during transfer from the slough. 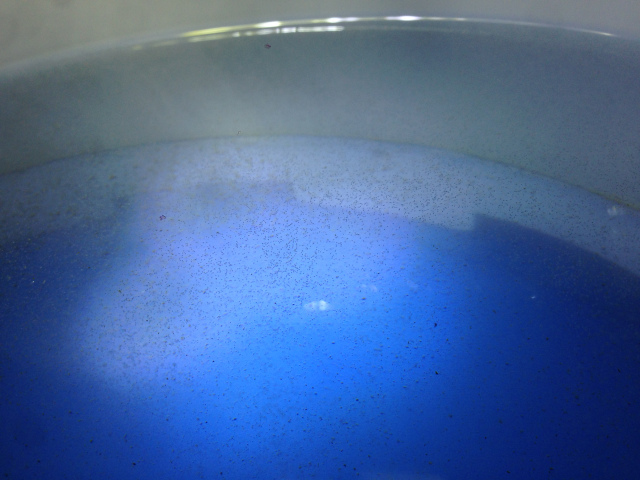 The grayish moving mass of water contained above the 100-micron sieve contains about 150,000 larvae, based on a few samples I examine under the dissecting microscope. This is the first step toward deployment of new juvenile oysters that may help bolster the population of Olys within Elkhorn Slough. Populations of these small oysters were plentiful until the late 19th century. Early Native American middens on the west coast contain traces of a variety of seafood, including the shells of the Olympia oyster. Olys are much smaller, and would require three or four to match the meat of the other two more popular Crassostrea, the Pacific and Eastern oyster. A mixture of human consumption and anthropogenic stressors, such as sedimentation from the Gold Rush in San Francisco Bay and pollution from industrial runoff, drastically diminished population sizes and transformed the habitat of these oysters to decrease likelihood of recovery. Larvae in the Olympia broodstock tank. UC Santa Cruz’s Dr. Kerstin Wasson, along with the Elkhorn Slough National Estuarine Research Reserve, has been monitoring the Elkhorn Slough Oly population over several years. They have concluded that these Olys have experienced half of a decade of unsuccessful spawns. Although the reason behind the failure for lack of successful spawning has yet to be elucidated, an older population may be more susceptible to mortality due to age. In addition to compiling multiple reviews and conducting studies on various populations of Olys, Kerstin’s expertise and familiarity with the slough has also led her to observe a size difference between oysters at two sites in the slough: Kirby Park and Azevedo Pond. These size differences have been attributed to differences in dissolved oxygen content between the two sites. 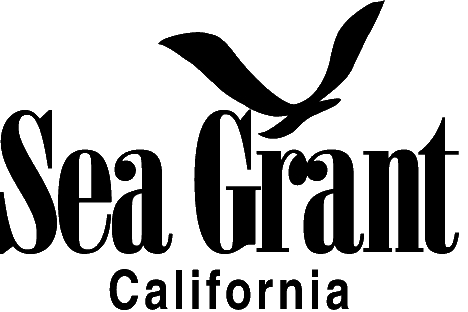 Dr. Brent Hughes, postdoctoral researcher and fellow from Duke University and UC Santa Cruz’s Long Marine Lab is an alumnus of MLML and has conducted extensive study on another inhabitant of Elkhorn Slough that has been deleteriously impacted by humans: seagrass. Seagrass and Olys cohabitate the intertidal and shallow subtidal regions. Seagrass can be characterized as a foundation species: it provides shelter for organisms seeking refuge from predators, organisms such as small crustaceans feed on it, and it disproportionately impacts its system compared to other marine plants and algae. Photosynthesis by seagrass is a vast contributor to dissolved oxygen concentrations in the surrounding water and the root system of the seagrass stabilizes the sediment and makes the mudflats more habitable by the Olys. Brent and Kerstin received a generous donation from the Anthropocene Institute to help restore the Oly’s in the slough and approached Professor Michael Graham of the Phycology Lab to collaborate with MLML in the process. Brent and Kerstin intend to study the effects of dissolved oxygen and other abiotic (environmental) variables on the demographics of Elkhorn Slough’s Oly population. Studies have shown that Oly (and other oysters) are most susceptible to succumb to stress mortality in their larval stage. Olys have evolved to produce hundreds of thousands of larvae per spawn to attempt to pass on their genetic heritage and overcome these mass larval mortalities. By taking some of the Olys from the slough and spawning them in a controlled environment, we may be able to minimize larval stress related mortalities. Peter and I are currently working to achieve this goal with the utilization of controlled and responsible aquacultural methods. These larvae that were just released need to go through a few more steps before we can deploy them back in Elkhorn Slough. Although Oly larvae will “settle”, or transition from their motile to sessile life stage, and become affixed to any number of substrates, they have a chemical preference toward settling on calcium carbonate. 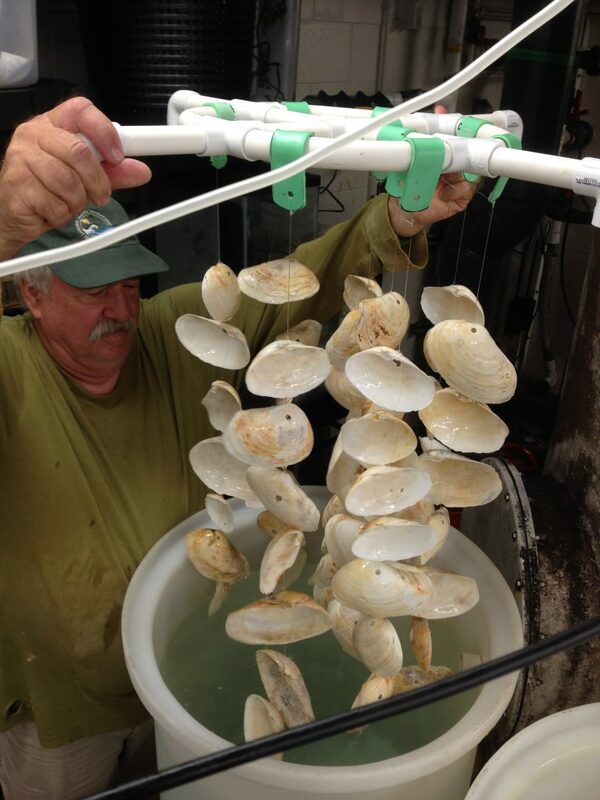 Although there are a number of natural calcium carbonate fixing organisms in the system, we plan on providing butter clam and gaper clam shells for the Olys to settle on. By attaching these clam shells to wooden stakes, we essentially create a multiple oyster unit that can easily be deployed into the intertidal zone in Elkhorn Slough. We can deploy a number of these units to multiple sites to aid the recovery of these small oysters. Wish these larvae luck as they spend the next few months in our aquaria room before they are reconnected with their native Oly population in Elkhorn Slough. California red abalone. Photo by Heather Kramp.